From the comfort of an armchair and with the aid of this new book, the reader can travel to the Breadalbane and Argyll of Duncan Bàn Macintyre; the Skye and Raasay of Sorley Maclean; and the Caithness and Sutherland of Neil M. Gunn. Photographs, maps and place-names linked to key passages in the texts will immerse readers in the landscapes which songs, poems and tales have described and enlivened over the ages. For those who wish to brave the weather, the insects, the sheer drops, the morasses and the vast spaces, the book can be used as a field guide taking the same walks followed by the author. The touch, smell and landmarks of song, poem and tale can be experienced. 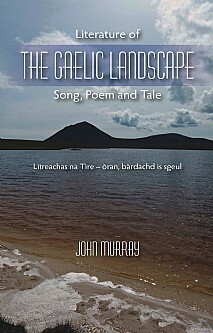 The author has immersed himself further in the Gaelic literature of place so that readers, with book in hand, can make the past come alive and appreciate the extracts about a place and what has happened there. As an adult, Neil M. Gunn saw himself as a boy, sitting on a slab in the middle of the river cracking hazelnuts with a stone. Through the eyes of Duncan Bàn Macintyre see Ben Dòbhrain and the journey of the deer to the holy spring, from the vantage point of Patrick’s stone. On Dùn Cana sit at the centre of the swirl of place-names in Sorley Maclean’s Hallaig. Journey around the north and east coasts of Caithness and Sutherland in the wake of the White Heather and the Seafoam, in the Silver Darlings. Literature of the Gaelic Landscape compares Gaelic literature with other world traditions and their relationship to place and storytelling, providing an overview of how the literature relates to landscape and place over the ages. This will be of huge appeal to everyone with an interest in Gaelic literature, songs, poems and stories as well as outdoor enthusiasts such as climbers and walkers.